This summer I got to participate in a lot of ministry. But if I only ‘did’ ministry and didn’t listen and learn, then I would be doing it wrong. In this series, ‘Summer School’ I present some of the lessons God taught me. Summer School Lesson 2: Who’s in Charge? When I volunteered to be the director for my church’s VBS (Vacation Bible School) this summer, my motives were selfish. 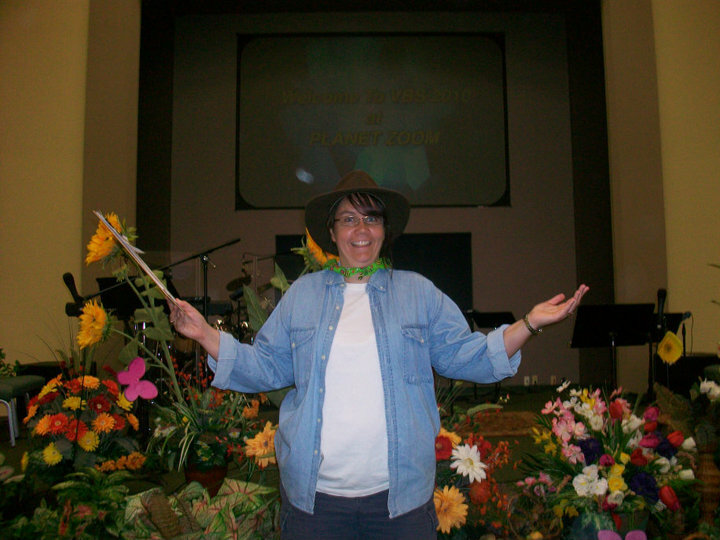 I wanted my three kids to go to VBS at our church. The fact that 50+ other kids also got to do it, too? That was just gravy. I am not equipped to do VBS, and I didn’t know exactly how the whole thing was going to play out. If I was really in charge of VBS, here’s how it would have gone: for crafts, kids, let’s do a coloring sheet. With Sharpies. Your moms will love that. For bible time, you kids can listen to me make jokes that are over your head and read from the book of Deuteronomy. Recreation? Well, just try not to hit each other too hard. Snack time…. Um, here’s a saltine and some water, now watch this Veggie Tales and be quiet for 20 minutes. Drama, well, isn’t there enough drama in our lives? Let’s skip that part. Music… um, where it the cd player? Because God knew I was not equipped to be in charge of VBS, He just let me think I was and instead He took over the details. He had the Body do it. You know… The Body of Christ- the Church. Like it says in scripture: Now the body is not made up of one part but of many….. But in fact God has arranged the parts in the body, every one of them, just as he wanted them to be. If they were all one part, where would the body be? As it is, there are many parts, but one body. He sent the most creative ladies in church for the craft room with a budget of under $30 to boot! He sent patient, fun bible study teachers who not only taught, but transformed their classroom into a desert oasis complete with tent and fountain. For recreation, He sent two amazing servants out in the Texas heat who managed to make everyday Water Day, and the kids never complained! Snack and a video? No thanks, said God’s snack team. Let’s have them build their own snacks as a craft that reinforces the bible lesson. Skip drama? Instead, God had His plan fulfilled by one of His saints to pull out all the costumes, all the props, cast all the extras to make the gospel come to life for these kids. Music? Let’s not just sing, whispers God in the ear of the music leader. Let’s worship and praise. And to lead the groups? God sent about 20 youth eager to love on and play with the little ones of this church. Now, says God, I will also give you an administrator, preschool director, sound team that all have one goal in mind- serving Jesus. My motives for VBS were selfish. I wanted my kids to have a week with their friends to build relationships. I wanted them to have a week with the teenage helpers to see that big, cool kids could love Jesus, too. And I wanted them to have a week with the adult leaders because there was a lot of knowledge and love being poured out from these folks. And I wanted my three children to benefit from it. They, along with 50ish new and old friends, got to do just that. All around, lessons were learned about Jesus and His great love. My lesson? Who’s in charge. Hint: it isn’t me. Looking for Summer School Lesson 1: Two are Better than One? Looking for Lesson 3: What about when He Hit You? Looking for Lesson 4: Are You Happy to Wake Up in the Morning? Looking for Lesson 5: That My Joy May Be In You?